DOJ Source Claims Rod Rosenstein Was Joking - Joe.My.God. 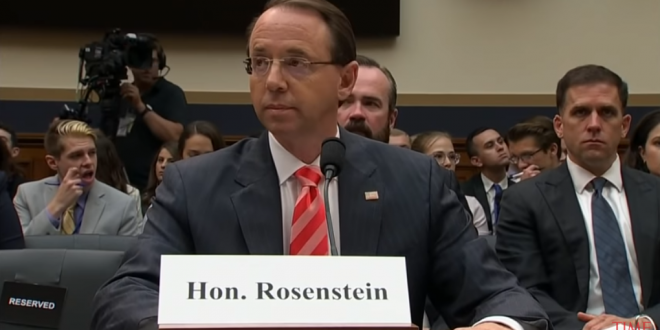 Deputy Attorney General Rod Rosenstein was joking when he discussed wearing a wire to secretly record President Donald Trump and does not believe Trump should be removed from office through the use of procedures outlined in the Constitution’s 25th Amendment, according to Justice Department officials who requested anonymity to discuss the conversation. In a May, 16, 2017 meeting at a secure facility at the Justice Department — one week after Trump fired FBI Director James Comey — Rosenstein was arguing with Andrew McCabe, then the acting director of the FBI, about the president, according to a senior Justice Department official. Other sources in the room briefed on the remarks were under the impression that Rosenstein was being serious and that spinning the comments as a joke is part of an effort to save Rosenstein’s job. Both articles cite memos written at the time by Andrew McCabe, then the acting FBI director, in which he noted Rosenstein discussing the 25th Amendment and wearing a wire. Michael Bromwich, McCabe’s lawyer, did not deny the description of the memos, but he said McCabe didn’t leak the documents.